A RESEARCHER at the University of Limerick has been awarded almost €1m in ground-breaking research funding to study a new class of materials that could help to reduce the footprint of global energy production. Professor Michael Zaworotko, Bernal Chair of Crystal Engineering and Science Foundation of Ireland Research Professor at the Bernal Institute University of Limerick, has been awarded €967,441.20 through the Irish Research Council 2019 Advanced Laureate Awards Programme, announced this Thursday. UL was successful in receiving the significant award under the frontier research programme which was announced by Minister for Education and Skills Joe McHugh TD and John Halligan TD, Minister of State for Training, Skills, Innovation, Research and Development and has a total investment of €11.8m. The investment will fund 12 researchers who are at an advanced stage in their careers and will be supported to conduct ground-breaking, world-class research across a wide range of disciplines. Professor Zaworotko’s research is aimed at solving global challenges related to commodity purification by significantly reducing the energy footprint, currently 20-30% of global energy production, needed to produce the most important industrial commodities. “Water, natural gas and ethylene are the primary targets for study. The Laureate Award will study a new class of materials that we call SALMAs - Switching Adsorbent Layered Materials,” he explained. “SALMAs are two dimensional structures that switch between ‘closed’ and ‘open’ phases; this gives them special properties. The idea is that SALMAs will have higher performance than existing sorbents and desiccants because they operate by a different mechanism (i.e. they are not rigid). A few were known before we starting looking at them but they have been understudied compared to their potential,” he added. Professor Zaworotko joined the University of Limerick in 2013, where he currently serves as Bernal Chair of Crystal Engineering, Science Foundation of Ireland Research Professor and co-director of the Synthesis and Solid-State Pharmaceutical Centre. He has published over 400 peer-reviewed papers, review articles and patents that have been cited over 42,000 times. In 2011, Thomson-Reuters listed him as the 20th highest impact chemist since 2000 and in 2014, 2015, 2016 and 2018 he was listed as a highly cited researcher in the field of Chemistry by Clarivate Analytics. In 2018 he was listed as a highly cited researcher in a second field, Pharmacology and Toxicology. 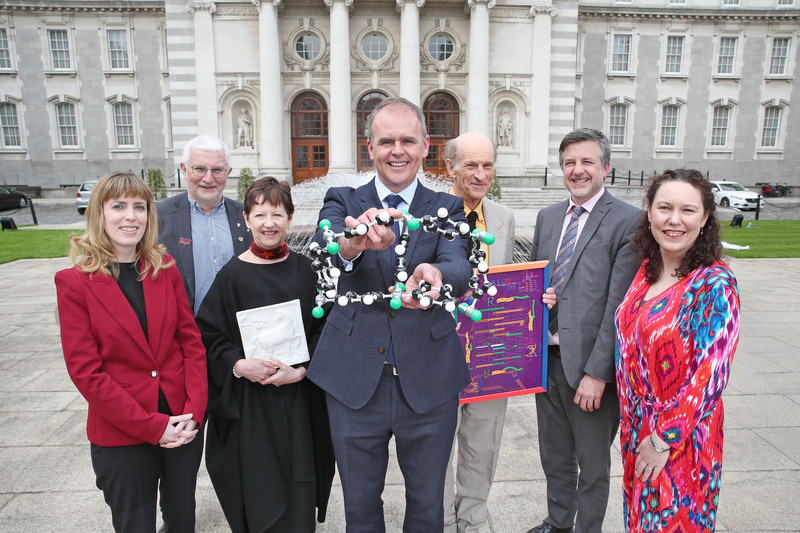 The other research areas being funded under the 2019 Advanced Laureate Awards Programme range from new approaches in breast cancer treatment to the development of 3-D printed batteries and digitally mapping the full range of cultural activity across languages and ethnic groups in early modern Ireland. Each awardee will receive a maximum of €1 million in funding over a period of four years. Education minister Joe McHugh said: “This scheme was specifically designed to address gaps in the Irish research and innovation landscape in the area of frontier basic research, as identified in Innovation 2020, Ireland’s five-year strategy for science and technology, research and development. “Funding frontier research is vital in order for us to compete with our counterparts on the global stage, and to promote Ireland as an attractive location for world-class talent, both homegrown and international, in order to bring new knowledge, skills and innovations to our research institutions,” he added. Peter Brown, Director of the Irish Research Council, said: “The 12 researchers who will receive funding under the Advanced Laureate Awards Programme are all exceptional in their fields and have been selected following a rigorous and independent international peer-review process. The Irish Research Council opened the first call under the Laureate Awards Programme in 2017, resulting in 36 awards with an associated investment of €18 million. Further information on the Advanced Laureate Awards is available at: http://research.ie/funding/advanced-ircla/?f=principal-investigator-led.